The garden is the perfect environment for upcycling as it provides a lot of opportunities to re-purpose disposable household items into something useful. The great thing is that this is usually very easy to do, and can improve the look of your garden as well as making it more eco-friendly. Below are a few quick tips to help you start upcycling in the garden. The best part of this is being creative and learning from others, so if you have any other upcycling tips please share them in the comments section at the bottom. There are lots of household items that can be used to plant seedlings. Paper towel tubes are the perfect shape to house seeds, and can be cut down to any length you need – making them highly adaptable. Old egg cartons and ice cube trays also make for great seed containers, as well as more creative and ‘out-there’ objects like light bulbs and old food tins – which can add a unique edge to your garden. Once your seeds have grown out of your upcycled egg cartons, it’s time to find bigger household items to house your growing plants. This is where upcycling for the garden can get very fun and creative! I’ve seen everything from old wellington boots to toilet cisterns, sinks and baths, drawers and even an old piano put to effective use to plant flowers and bushes! For purely aesthetic reasons, my favourite is the use of an old teapot – which can add to the quaintness of a garden and provide added colour (depending on the style of the teapot). 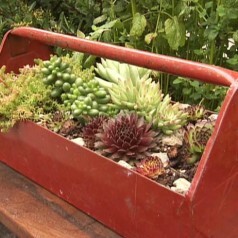 Old toolboxes also make great planters, particularly in a more ‘rustic’ garden design. One of the biggest strains gardeners can put on the environment is their use of hosepipes to regularly water their plants. If you live somewhere that has a reasonable amount of rainfall, then you can easily collect that for watering purposes using anything from old mop buckets to old guttering and even dustbins. Upcycling in the garden doesn’t have to just be limited to practical uses like planting and watering, old household objects can also be used to decorate the garden. Wind chimes, for instance, can be made out of almost anything you have laying around – like old CD’s or even cutlery. Instead of throwing out your old cabinets or wardrobes, they can be adapted and decorated to make great bird tables, and old tyres and shoe soles can make charming welcome mats. Basically, anything you are about to throw out can be re-purposed for use in the garden – all it takes is a bit of creativity! If you have any quick and easy tips for upcycling in the garden, please share them in the comments below.